Except for my driveway, the raised boxes I use to grow vegetables and a couple of utility beds near the house, the straight line has pretty much been banned from my garden. Our house sits near a nature area, and curved shapes seem more appropriate in a wild(ish) setting. Still, I cannot help but appreciate the discipline and beauty of a formal garden. Over spring break, my younger daughter and I visited the older girl, who is studying in Rome. With two young women in the travel group, gardens were not on the top of the priority list — shopping, gelato, admiring the fashionable Italian dudes, more shopping, and visits to art galleries, old churches and outdoor cafes were our main activities. But, we did see a couple of gardens. 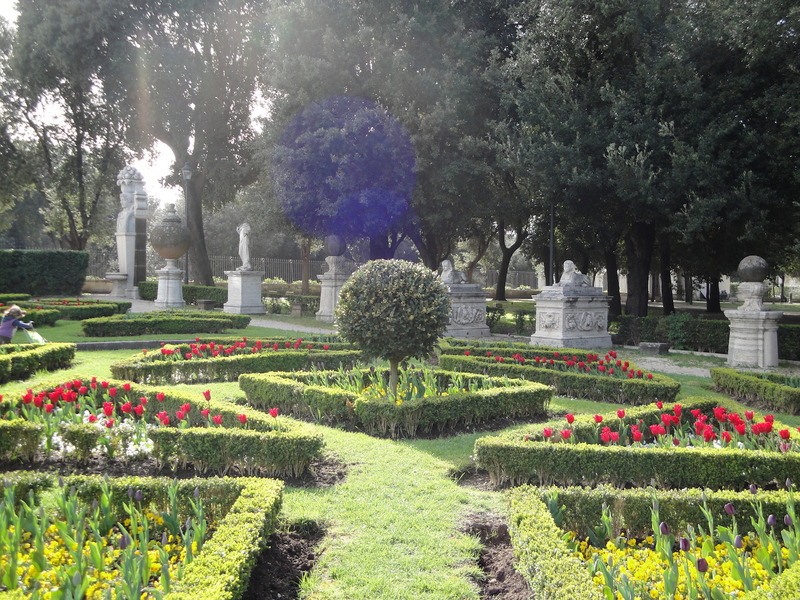 At the Villa Borghese — the Central Park of Rome — the formality of the gardens surrounding the famous Galleria Borghese were as lovely as the Bernini sculptures inside. Here the gardens are all clipped boxwood, straight rows of iris, and formations of tulips in triangles. The garden above is one of three “secret gardens” surrounding the art museum. They are visible from inside, in one case in a surprising, delightful way. They are spaces that seem to invite play (some toddlers were kicking a soccer ball around while we visited) and relaxation. While formal, this is also a restful place. The strict imposition of order and regularity seems to relax the mind. In a big way, formal design is about people controlling nature. I’m not sure we can (or should) do that, but in some environments a formal garden is pure delight. 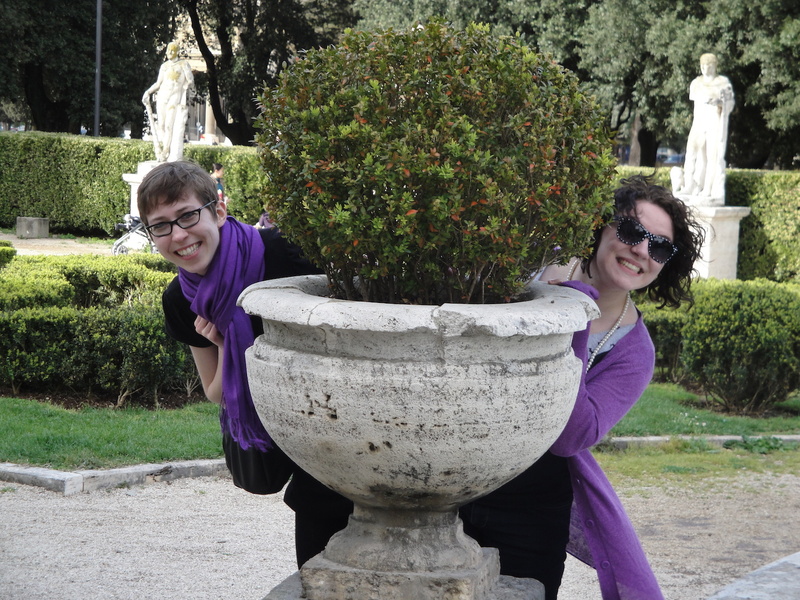 Having fun with the shrubbery in Rome. If you are interested in what makes a formal garden, check out this guide from About.com. I trip to Rome sounds great right about now. It is snowing: ugh. I enjoy straight lines very much (as long as they are softened a bit with greenery). Trips are so broadening – even when the gardens we see are not our style at all. We can see and appreciate new beauties.